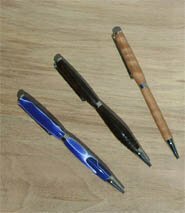 There are a lot of pen collectors who cherish fine wood pens. Each pen is special because each piece of wood presents its own unique grain pattern. 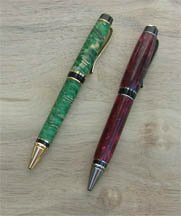 Finished pens from the same base block of stock will produce similar, though individualistic, writing instruments. We learned the art of pen turning some time ago and have sold several hundred to both casual and passionate buyers. About a dozen have been sold while using the pen in a store or restaurant. People truly appreciate fine craftsmanship and especially enjoy meeting the person who made the piece. We've learned to always have a pen with us and we do not sell through stores. There seems to be no prevailing preference in style or design when it comes to customer orders. Buyers can and do choose all types of hardware be it chrome, gold, or otherwise. Ball point inserts are every bit as popular as rollerball. Fountain pens are in their own category and command a higher price. Wood provides a satisfying feel in the hand. Grain patterns and color varies with species. Plastic and acrylics shine in the light and offer more colorful options than wood. There really are no wrong choices. We turn our pens to order. Contact us for options, pricing, and details. For large orders of a dozen or more, we will turn a sample for your review before committing either of us to a full production run.